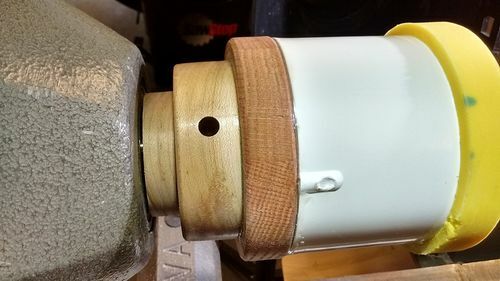 I have been looking for a better way to hold work on the lathe, particularly for finishing the bottom of bowls and hollow forms. I have tried Cole Jaws, Longworth Chucks, jam chucks, etc. with varying degrees of success but nothing I was completely satisfied with. Then I saw the Frugal Vacuum Chuck … http://www.frugalvacuumchuck.com/ ... in a friend’s shop, and knew I had to have one. At a recent symposium, I connected with Frugal Vacuum Chuck inventor Bob Leonard and came home with one of his ‘Plug’n’Turn’ packages. Assembly is quick … the manufacturer says 15 minutes after unpacking you can be turning (I had mine up and running in about 10 minutes). They offer lower cost packages … the trade-off is they require more assembly time. 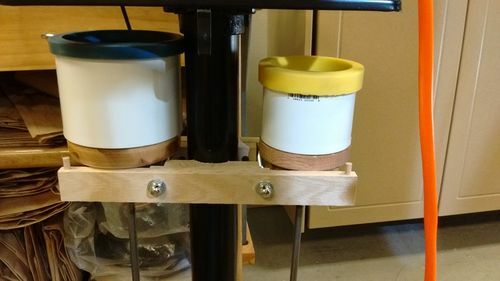 I mounted mine on a grinder stand with a rack underneath to store my PVC cups. This thing is incredible. Depending on the surface of the piece you are holding, the Frugal Vacuum Chuck draws upwards of 25” Hg, which results in about 185 pounds of holding power. 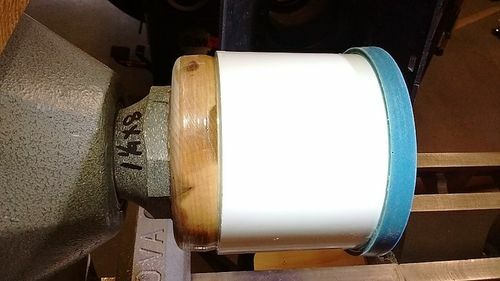 Though my original intent was to use it for finishing only, the hold is so good I cranked the lathe up to about 1500rpm to repair some damage and re-turn the the bottom of a vase (I did bring the tail stock up for additional support, but I think the Frugal Chuck would have held fine without it). The craft foam gaskets will wear out fairly quickly, but closed-cell foam is available at reasonable cost at virtually every craft store. The Rubber Chucky seals cost more than craft foam, but I think they will last longer than the craft foam and may be less prone to failure. To use the Rubber Chucky seals, I needed to make new PVC cups (they don’t fit the cup supplied with the Frugal Vacuum Chuck), but that was easy as Frugal Vacuum Chuck offers parts kits (bearings, washers, rods, and detailed instructions) so you can make your own PVC cups. A quick trip to the plumbing department at Menards, and an hour or two at the lathe and I was in business. The PVC cup has a sealed bearing that is connected to a steel pipe that extends through the headstock. At the rear (by the hand wheel) the steel pipe connects to a vacuum hose that is in turn connected to the pump. The pump draws air out of the cup, creating suction which in turn holds the bowl, vessel, etc. on the cup. The first photo shows the bottom of a hollow-form spinning at 1500 rpm with no tailstock support. When I first set it up, I slapped a piece of 1/4” plywood on the PVC and fired up the pump … it created a noticeable depression in the plywood! Recently, I got a PM from a member who is interested in the Rubber Chucky seals, but was confused by my reference to making new PVC chucks. He wanted to know why they didn’t fit the 3” & 4” PVC chucks Frugal Vacuum sells. There are several different specifications (called ‘schedules’) for PVC pipe. I think Frugal Vacuum Chuck is using fittings for schedule 30, while Rubber Chucky is designed for fittings for schedule 40 pipe. Schedule 40 is heavier and thicker than schedule 30. I trimmed the pipe on Bob Leonard’s 4” Frugal Chuck down on the lathe and glued a schedule 40 fitting over it. I made my 3” chuck from scratch using a schedule 40 fitting.